Educational research has repeatedly shown that compared to traditional teacher-centered instruction, certain learner-centered methods lead to improved learning outcomes, greater development of critical high-level skills, and increased retention in science, technology, engineering, and mathematics (STEM) disciplines. The strategies presented in Teaching and Learning STEM don't require revolutionary time-intensive changes in your teaching, but rather a gradual integration of traditional and new methods. The result will be continual improvement in your teaching and your students' learning. including its preface, foreword, table of contents, first chapter, a reading guide, and reviews in 10 prominent STEM education journals. RICHARD M. FELDER, PHD, is Hoechst Celanese Professor Emeritus of Chemical Engineering at North Carolina State University and author of the bestselling Wiley textbook Elementary Principles of Chemical Processes, now in its fourth edition. He is the inaugural recipient of the Lifetime Achievement Award in Engineering Education, presented in 2012 by the American Society for Engineering Education. REBECCA BRENT, EdD, is President of Education Designs, Inc., a consulting firm in North Carolina, and is a certified educational program evaluator. Prior to her work in consulting, she was an associate professor of education at East Carolina University. Separately and together, Drs. Felder and Brent have published over 300 papers and presented over 700 workshops and seminars on STEM education on campuses around the world. "Felder and Brent, longtime leaders in STEM education research, fill an important gap by providing both insightful and very practical guidance for the college instructor trying to translate the findings of STEM research into effective classroom practice." 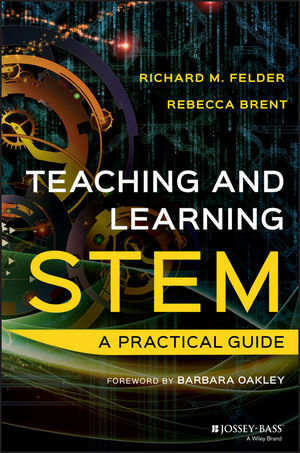 "In their research-based, direct, and exceptionally readable style, Felder and Brent provide one of the few--and the best--practical guides to teaching in the disciplines of science, technology, engineering and mathematics. From designing a course to teaching students to assessing for learning, busy faculty members will find countless, creative, and straightforward strategies for creating a more learner-centered, evidence-based teaching environment." "While designed for university faculty, Teaching and Learning STEM serves equally well for high school teachers of STEM courses, particularly those of us working with advanced level students. The chapters on active learning, effective use of technology, and developing problem solving and creative thinking skills should be studied by teachers of all subjects working with students of any age." "Richard Felder and Rebecca Brent have created a treasure chest of wisdom and practical strategies for improving learning. It is organized in a way to be accessible to first-time and veteran educators alike, and I have already started applying their ideas in my classroom." "Imagine a book that is like having a welcoming and seasoned faculty colleague just down the hall, ready with engaging stories and sage advice. That is this book." "This is my all-time favorite book on teaching.."